EARTH FRIENDLY: Absolutely no metals, plastics, stains, varnishes, or oils are used in our caskets, and our glue contains no formaldehyde. To help restore America's forests, we plant a tree for every pine casket purchased. THE ARK ECONOMICAL DESIGN: Our special dowling system allows caskets to ship flat and store compactly, saving greatly on cost. When the casket is needed, you join the six panels by simply tapping in our self-gluing dowels. This easy assembly takes 30 minutes or less. Soft rope handles provide strength and ease of carrying. YEARS OF SERVICE: Ark Wood Caskets has served individuals, congregations, burial societies, and funeral homes since 1993. Why Buy a Wood Casket Kit? When the time comes there will be differences of opinions and unnecessary conflicts over what and how things should be done. Do the right thing and talk about your likes and dislikes and then you can write a small note about your wishes and put it with your will and other important papers. Your family will really appreciate it . If you want to pre buy a funeral plan or a casket shop around it’s ok. Some folks like something simple and not the price of a new car. They don’t want their loved ones spending a lot of money on something that they would not have bought for themselves. 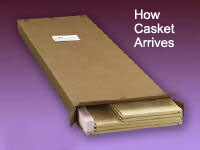 So can you pre-buy a casket other than at the Funeral Home. The answer is yes. The problem is that a casket takes up plenty of room no matter where you store it. 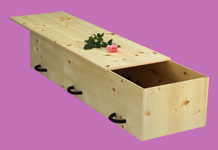 The Ark Wood Casket is very easy to store and is well packed in a double walled cardboard box. It will come out of the box in the same condition that I put it in there. How do I know that, because I sold a casket to my friend George and he had it in his garage for 21 years and on a visit not to long ago he told me he changed his mind about burial and will be cremated instead and would I take the casket and donate it to someone in need. I have to admit I was very curious to what I would find in the box. The casket was in fact in the same condition that it was when I packed it up 21 years before. What could damage the casket while in storage, well I know real cold weather or real hot weather will not do any damage to it because I have stored them in conditions like that. The only thing that will hurt the casket (besides dropping it off the back of a pickup) is WATER. Keep it dry and it will serve you well no matter how long it’s in the box. So just how easy is it to store? The size of the box I ship them in is 82” long by 25” wide and just 5” deep. This is smaller than a twin mattress in it’s box. The weight is 95 lbs. Assembly of the casket kit can be done by one person but two people make it easier. There is no metal used in this casket, no screws, nails, or staples. The casket is put together with hardwood dowels which have the glue dried right on them so one drop of water in the dowel hole and tap in the wood dowel. The thick 1+1/8” rope handles are soft to the hand and very strong helping the casket carry up to 300lbs. By choosing an Ark Wood Casket Kit you will have the peace of mind that you have just what you wanted and at a sizeable-savings from other retail casket sellers. A Simple pine casket fulfilling your spiritual, cultural & economic needs.